"Positive Training for Positive Results"
to bond to her dogs and teach them good manners or tricks and to keep the training fun and positive. Some years ago, after watching her first dog trial, Joan became hooked on dog training. She has since owned and trained a variety of breeds including: a Great Dane, a Greyhound, a Collie, two Shelties and presently, two German Shepherds and a Papillon. Kary received her first 2 Shelties in 1999 and they taught her a lot. She knew immediately that she would have to learn agility for Saska as she was weaving the bushes in the backyard at 10 weeks old. Kary taught classes in various schools and has taken plenty of classes and private lessons from well known handlers. Kary has attended several Clean Run camps. C-Sea granted her the privilege of qualifying and attending AKC Nationals in January 2006. C-Sea ended up as the #1 14 inch jumper on the PA Team. 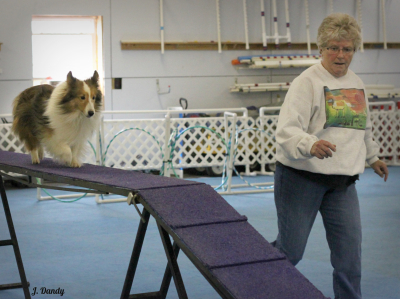 All of Kary's shelties perform in agility, herding, and obedience. Kary believes all dogs need a job and that all training can be accomplished through positive methods. Kary is most privileged to have several sheltie companions that make her daily life a delight. Bridget grew up on a farm here in Newville and although surrounded by all sorts of animals, it was her love of dogs that shaped her life. For 26 yrs. Bridget has been grooming dogs and the last 16 yrs. has owned her own business on the farm called Bridget’s Bow-wow Grooming. Bridget started training dogs in the early 80’s; barely remembering the harsh pulling on the leash techniques and realizing that was not for her or her dog. It wasn’t until she found positive reinforcement training that Bridget truly became hooked! Since then, Bridget has trained and competed in numerous areas with great success: freestyle, herding, rally-obedience, agility, dog scents, tracking, disc dog, obedience, conformation, rally-free, barn hunt, and tricks. Her dogs, all Aussies, have titles in freestyle, agility, rally, rally-free, barn hunt, and tricks as well as Championships in freestyle (PDP/MF & PDP/HTM), rally (ARCHMX), rally-free (R-FE/CH) and tricks (TDCH). In 2002, Bridget began teaching dog classes. Since then she has taught classes in: freestyle, basic manners, intermediate, and advanced basic/CGC, rally, tricks, and rally-free. She has been an instructor at Dandy Dog Training (DDT) since 2009. Bridget became a CTDI (certified trick dog instructor) in 2011 and is honored as the first CTDI in the USA as “All-Star Trainer of the Year” in 2014. Her Aussies; Pixie, Parlor, and Truly, are trick dog champions! She also became a RFE-CI (certified Rally-FrEe Instructor) in 2012. Lorraine first got into dog training with her family dog, a Golden Retriever. 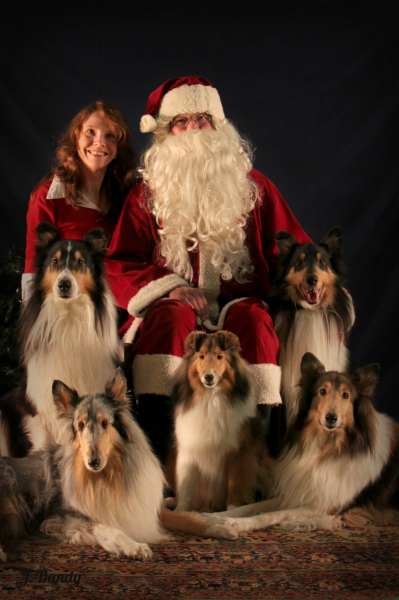 She got her first Shetland Sheepdog, Skye, in 1998 and have had Shelties ever since. Lorraine’s current crew consists of four Shelties, Reggie, Alex, Stewart, and Amy. While using positive reinforcement training methods, she has trained and titled in Obedience, Agility, Rally-O, Freestyle, Rally-FrEe, Tricks, Nose Work, Lure Coursing, Barn Hunt, and Tracking. She enjoys finding what her dogs like to do, and having fun working as a team together. 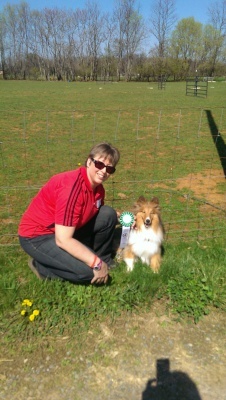 Lorraine is a member of the Carlisle Dog Club, York County Dog Training Club, the Harrisburg Shetland Sheepdog Club, and has been training at DDT since the opening. She has been teaching Rally, and Basic Obedience for quite a few years. She has also taken classes and gone to seminars since she first started working with her Golden, Vicky. Her dogs have made her life richer and have allowed her to meet many wonderful people who believe in training with love and positive methods while having a great time with their dogs. Pam's training career started when she was 16 and received her first puppy as a birthday present. She began to work with the puppy and without even knowing it trained the dog to pass CGC/TDI test without ever knowing what the test were. Her and her dog took and passed them on the first try. At that point Pam knew she had to explore more formal training methods and learn how it all 'really worked'. At that point Pam began formal obedience training and in 2006 started at DDT as an assistant instructor and over time took on a larger roll as a basic instructor. She has taught both advanced and beginner basic classes. 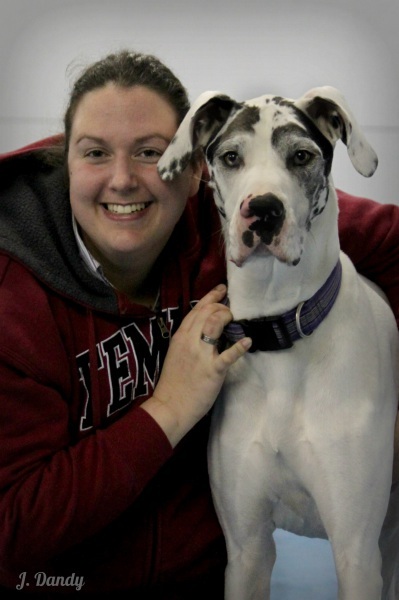 Currently Pam has 2 great Danes and participates in rally, agility, and obedience. Kristine Hammar currently has three Border Collies, Dean Dog, Tessa, and Bandit, who she trains and competes in Agility, Freestyle, Rally FrEe, and Rally-O. She began training dogs in 2002 after getting a fearful BC puppy named Speedy. Helping Speedy to be more comfortable and relaxed is what pushed Kristine to learn as much as possible about basic behavior modification and clicker based training. Through Kristine’s hard work, Speedy went on to compete in Rally-O and Musical Freestyle. The knowledge that Kristine gained from her experience, she shares in the CU 2 class at DDT. She has also been known to help with Rally, Freestyle, and Foundation Agility Classes. Kristine’s biggest objective as a trainer is to use training and dog sports as a means to help a dog have as much confidence and joy in life as possible. Cathy Markley is our Jumper extraordinaire at DDT as she teaches all of our Jumping classes. She has 25 years of experience training horses and got involved with agility after seeing it on TV in 1999. After troubles with one of her own dogs, Cathy began studying canine jumping and has since learned and combined many differed theories to create her own jumping program. Cathy currently has eight dogs, including five Border Collies and three Chihuahuas that she actively trains and competes in agility. Cathy loves to watch dogs learn how to better control their bodies, which then gives them the ability to improve their jumping skills. Chris Eicher is an agility instructor at DDT. She started training dogs in 1996 with her first dog, Stoli. Through Stoli, Chris found a love for dog sports, specifically agility. Her next dog, Gryphon became one of the top five agility labs in AKC! Chris currently is involved with her two labs, Bolt and MacGyver, in Agility, Barn Hunt, Obedience, Tricks, and Rally. 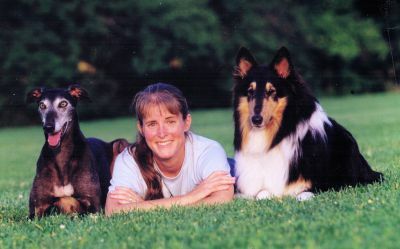 Over the years, Chris has attended many agility seminars, camps, online courses, and expos to better her understanding and knowledge of canine conditioning, jumping, relationship building, and connection with her pups. Chris loves seeing her students succeed and actively uses her knowledge to further their success. Bonnie Opal has been teaching for nine years and helped to create the Foundation Agility program at DDT. She began training when she got her first dog in 2002, a rough collie named Petto. After seeing an agility trial on TV, Bonnie’s goal was to compete with her own dogs. She currently has three rough collies: Wonder, Petto, and Kobabner and two Shelties: Lina and Edward. While Bonnie has competed in Obedience and Rally, her love and passion is Agility. Bonnie and her dogs have been to six different AKC National Agility events (2011, 2014, 2015, 2016), USDAA National (2015), and the US Open (2014). From 2013 to 2016 Bonnie and her dogs have been trying out for the World Team, in 2014 Lina was an alternative for European Open Team. This is a huge honor! Bonnie’s goal for her students, is to have success while having fun with their dogs while gently pushing handlers out of their comfort zones. 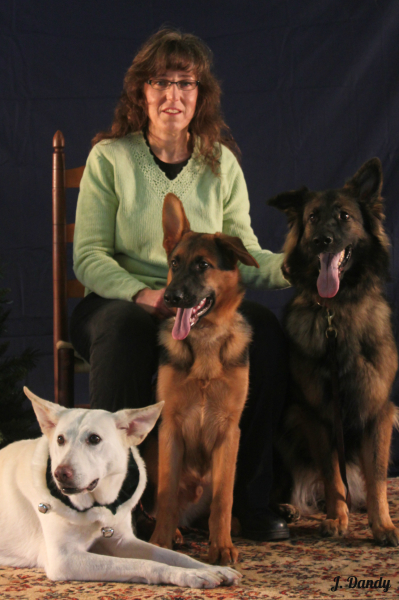 Karen and her dogs have been active, over the past 30+ years, in a wide variety of dog sports. These include but are not limited to Agility, Obedience, Rally- Obedience, Conformation, Freestyle, Tracking, Herding, Therapy Work, Tricks and Barn Hunt. Each activity adds different tools to the tool box of learning, communicating, understanding and teaching. Karen also enjoys learning through attending conferences, workshops, online classes and publications. Karenblends her background in Speech-Language Pathology, Teaching and Learning Theory to dog training. It is the challenge of helping others, to understand, and then to communicate with others that Karen enjoys the most.Over the years she repeatedly comes back to two phrases that sum up her philosophy. These are that you do the best you can with the information you have at the time and that there is more than one way to teach anything. The important thing is to try to find the best way each individual learns. Breaking skills down, thinking outside of the box and making it fun helps to master new skills and concepts. Success comes from communication, understanding, and confidence. Joan Wert began training dogs after she got Pam, an off-the-track Greyhound in 1998. Through dedication and patience, Joan and Pam then started Agility training. This led to a love for the sport and the adoption of her next dog, Molly. Currently, Joan has two German Shepherds—Circa and Fury—who she competes with in Obedience, Rally, Agility, and Scent Work. At DDT, she teaches the Dog Scent 1 class to help new students learn the joys of working with their dogs to find different scents in the new sport of ‘Nose Work’. Debbie Sherman began teaching at DDT in 2011 by instructing the ‘CU’ class at DDT and has since developed the ‘Life Skills’ class. She began training horses in her 20’s and started with dogs in 2000. Debbie has 4 dogs, a cattle dog/husky mix, a rottie/newfie mix, a BC and a rottie. With these dogs she trains and competes in Agility, Barn Hunt, and Herding. Debbie LOVES to do tricks training and is now a certified DMWYD (tricks) instructor. She regularly attends Karen Pryor conferences to stay current with new methods for teaching humans how to have better communication with their dogs and how to change the conditional emotional response in their dogs. Debbie opened her own business, ‘Positively K-9 + more’, in 1999 in Newport and she is a strong believer in doing something with her animals that is as good for them as it is for her. Jenifer Brimmer teaches Beginner and Advanced Basics at DDT. 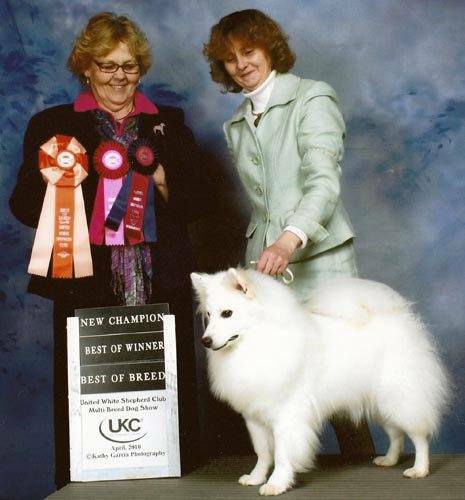 She began dog training after she got her first American Eskimo Dog in 1993 who needed a boost in confidence before showing in Conformation. Currently Jen has several American Eskimo dogs and Icelandic Sheepdogs. She trains and competes in Agility, Rally, Rally Free, Conformation, Barn Hunt, Lure Courses, Herding, Obedience, Tricks and Freestyle with her dogs. Jen enjoys watching the new and young dogs and owners connect the dogs as they learn how to communicate with each other. "I received my first dog, Ginger, when I was 11 years old. I was her main caretaker and absolutely loved training her. When I grew up and it came time for me to decide that I wanted to do, it was clear to me that it had to be something in the dog world. After receiving a career diploma in Dog Obedience Training and Instruction from Penn Foster, I realized that what I really needed was some hands on learning from an experienced trainer. I opened up my phone book and found an ad for Dandy Dog Training, and immediately checked out the website. After reading their Philosophy, I decided this was the place for me. After about a year of learning from Joan, she decided that I was ready for my own class. Though I’m still fairly new to this exciting world, I absolutely love every minute I spend in it, and at Dandy Dog Training!" 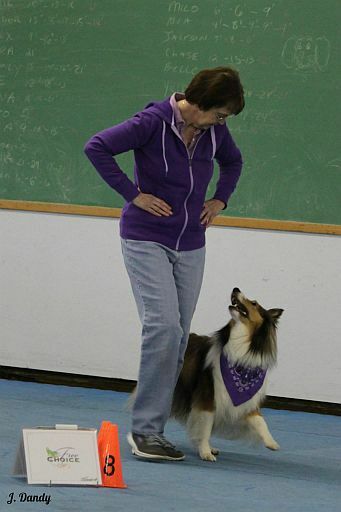 Judy Fegan has been teaching foundation agility and competition obedience at DDT for the last 6 years. She has been working with dogs for 40 years, ever since she put one of her own dogs into an obedience class. 10 years later, Judy started helping others to train their dogs. Judy currently has 8 shelties. Of the 8, 4 are pets and four are performance dogs. Judy and her pups train and compete in Obedience, Agility, Herding, Scent Work, Rally-O, Tracking, and Therapy where the children read to the dogs. Stephanie Peebles started training dogs in 2005 when she got Harley, a Golden Retriever/Collie mix. This is when she started participating in basic obedience and Rally classes. In 2008, Stephanie started teaching at DDT as a substitute instructor and has since focused on teaching CU classes. While stationed in Italy, Stephanie privately taught behavior classes such as Control Unleashed and Behavior Adjustment Training which has led her to pursue a bachelor’s degree in animal studies and psychology at Wilson College in Chambersburg, PA. Currently, Stephanie has two dogs, Oliver (Beagle) and Liam (Border Collie) who she trains and competes with in Agility, Rally, and Freestyle. 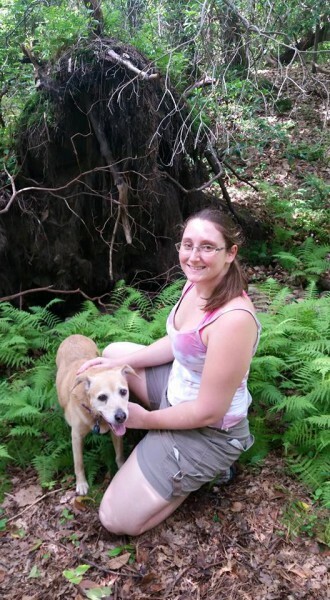 Stephanie believes in training to meet each dog’s specific emotional, physical, and behavioral needs.